The Pedersoli Derringer shot a reasonable 10-yard group after the trigger pull had been lightened and the point of aim adjusted by aiming about 2-feet low and 6-inches left of the target. Henry Deringer of Philadelphia made many types of guns, but the pistol that he is most noted for were the cased sets of small single-shot pistols which were the “pocket pistols” of the 1860s. These were sold as cased pairs in .40-.50 caliber. The most famous of these guns was the “Lincoln Derringer” which John Wilkes Booth used to kill President Lincoln at the Ford Theater in Washington D.C. After Booth fired his shot into Lincoln’s head, he dropped the pistol, pulled a knife, stabbed Major Henry Rathbone in the leg, jumped to the stage, injured his leg, shouted to the audience and made his escape. A cased set of original Henry Deringer pistols with all accessories. This pistol is a size larger than the Lincoln Derringer and has a ramrod. The mate to the Lincoln Derringer has never been recovered. There was once speculation that the original Lincoln Derringer had been taken from the display at the Ford Theater and replaced with another gun. An investigation by the FBI authenticated the Ford pistol by its serial number, an unusual rifling pattern and a distinctive crack in the stock. This pistol may be seen in a museum in the basement of the theater, and the .45-caliber bullet is also preserved at the National Museum of Health in Washington D.C. Of Deringer’s pistols, the one used by Booth was of medium size, iron mounted, engraved and had a rifled bore. 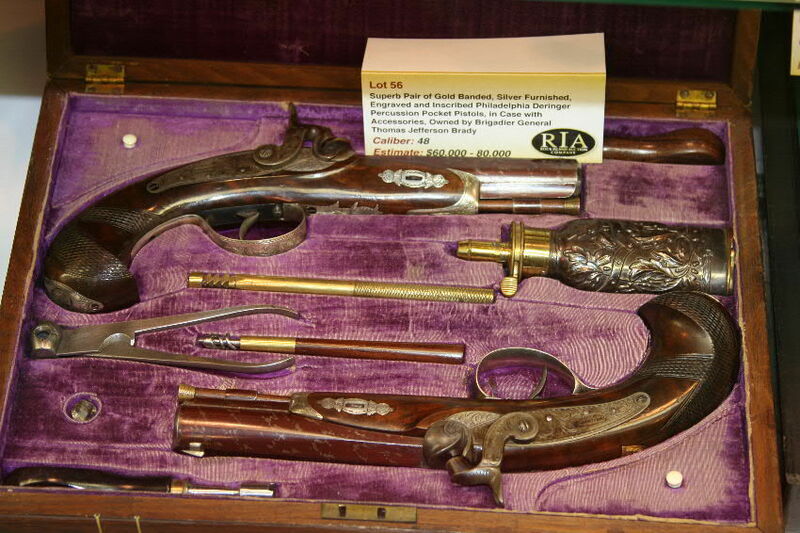 The Pedersoli replica is similar in size and caliber, but uses brass mounts and is sold as a single gun. I, like many people, was curious about these guns, and I arranged to receive one of the new replicas from Dixie Gun Works for testing. The pistol had front and rear sights, a broached rifled barrel with flat lands and grooves, a nicely fitted stock and a tiny back-action lock. The gun could be entirely concealed in the palm of a large man’s hand, and could be carried in a coat pocket; although the presence of the hammer made it less convenient for pocket use than today’s flat-profile semi-autos. As received, the hammer hit the edge of the percussion cap with the lip of the hammer nose, resulting in the gun needing three strikes to fire a cap. I used a Dremel tool to grind away the front part of this lip so that the hammer would strike the full face of the cap. After this modification, the pistol fired reliably throughout the test.The trigger pull on this gun was long and very heavy. I smoothed up the interior parts with a fine stone and removed some metal from both limbs of the combination trigger-main spring. Although the pull was still long and stiff, this was a considerable improvement. I now felt that I would give the pistol a reasonable test. A 15-minute video of my loading and shooting the pistol may be seen at: http://youtu.be/YiIeURpyi34. 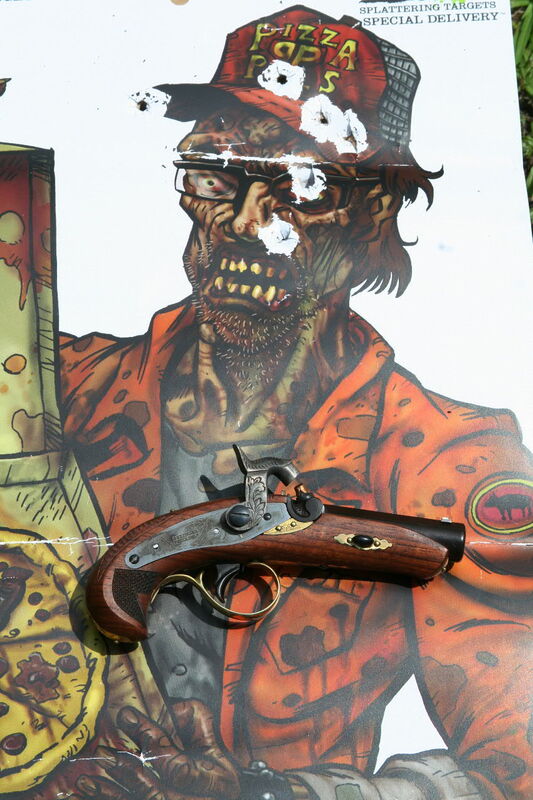 Although “Derringer Vs. Zombie Pizza” is somewhat tongue-in-cheek, this brief shooting session revealed much about the accuracy, range, velocity, muzzle energy and best use of this gun. These were/are low-power pistols that are difficult to shoot and are best used at ranges of only a few feet. The pistol developed only a little over 425 fps. velocity and 53 foot pounds of energy at about 8-yards. This is very similar to the velocity and energy recorded for the .41 Rimfire cartridge used in the Remington double Derringer and other pistols chambered for this round. These low figures are due to the Derringer’s very short barrel which, when loaded, allowed only a little more of an inch of effective barrel length to burn the powder charge. Not only was the gun’s trigger pull tough, even after I had worked on it, the gun shot nearly 2-feet high and 6-inches to the left. The front sight on the Pedersoli could be adjusted to correct the lateral displacement and filling down the rear sight would lower the bullet strike. As this was a loaner gun, I did not make these adjustments and held low and right on the target to move the bullet’s impact into the head area. With a two-handed hold and careful attention to the trigger pull, I was able to shoot a reasonable 10-yard group. With more work, this gun can do better, but there is little one can do to overcome its lack of barrel length. I tried a charge of Hodgdon’s Triple Seven, but this failed to fire with the Remington No. 11 cap. It is inescapable that although this pistol has a reasonably large caliber, it is a low power and comparatively ineffective self-defense gun; although it undeniably killed Lincoln. When Booth shot Lincoln he was standing very close with the gun’s muzzle only a few feet from the president’s skull, according to period drawings. The ball impacted squarely on the back of the head and penetrated into the brain. Had the ball struck to one side, it likely would have bounced off the skull. The recovered bullet is a half-moon shape showing where it had flattened against the bone before penetrating the soft tissues. Penetration tests against a thick Thomas Register showed that after hitting the cardboard cover, the bullet penetrated about 30 pieces of paper and tore about another 30. This bullet was flattened very much like the one recovered from Lincoln’s body. When fired against soft tissue, the pure lead ball did not expand and penetrated 46 pieces of cardboard. Fired towards a person’s chest this bullet might bounce off a rib if hit at an angle as when a person were standing sideways to the target. If it slipped between two ribs, it would likely penetrate the chest and impact against a rib on the back of the body. If it hit a rib squarely, it would probably penetrate and damage interior body tissues. Booth, in his assault on Lincoln also carried a knife and used it to stab Major Rathbone before he jumped from the box to the floor of the stage. Anyone who relied on a Derringer as an offensive weapon would need to carry a knife, because the likely result of a shot from this pistol would be to only partly disable an adversary. The person who was shot might ultimately die, but he could probably beat you to death before he did. The only hope that a person had who was facing a determined armed adversary was to wait until his opponent was very close and shoot well. Although modern Derringers are now often chambered for more powerful cartridge rounds, they remain very difficult to shoot with accuracy at ranges of more than a few feet and lack the barrel length to develop full velocities. Now, as it times past, it is prudent to practice with this gun so that you know where it shoots and how to manipulate it under stressful conditions.